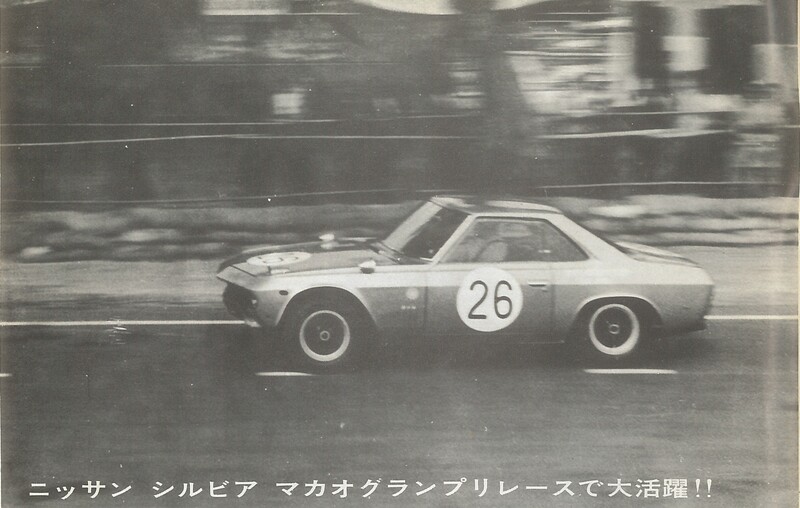 This page covers Nissan Silvia’s involved in all levels of motorsport in the mid to late 1960’s and is by no means complete. Please, if you have an image, a motorsport result or can fill in any missing information I would be glad to hear from you. Let’s start with what I don’t know…. 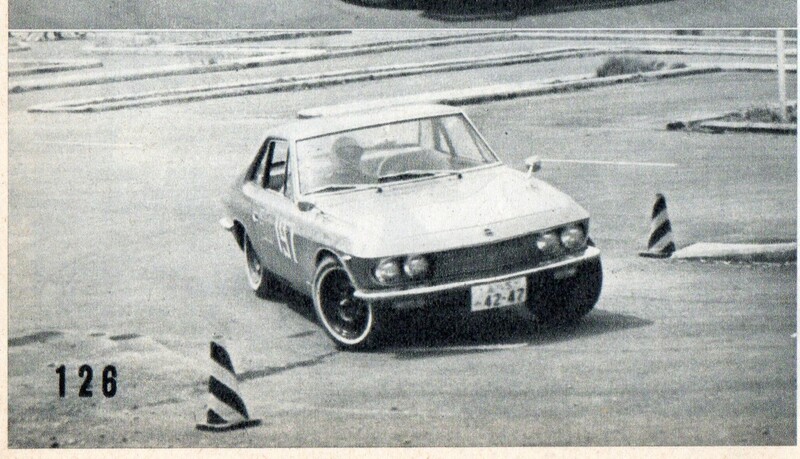 This is from a 1968 Japanese published motoring magazine (The Monthly car) but has no details as this image for a generic one for a engine tuning article. Car number does not match the races I have found. So, what was the race event? Who was the driver? Where did the Silvia finish? From what I can gather, this is MINATO Kengo about to start a gymkana event at Funabashi circuit. MINATO san is a former JAF sports chairman, an NDC Tokyo member and former Chairman of SCCN. He seems to have contributed to the early Japanese motorsport scene in his Nissan Silvia. You can just see the NDC Tokyo banner behind the Silvia in the second picture. Does anybody know the date for this event? Where did MINATO Kengo finish in the event? 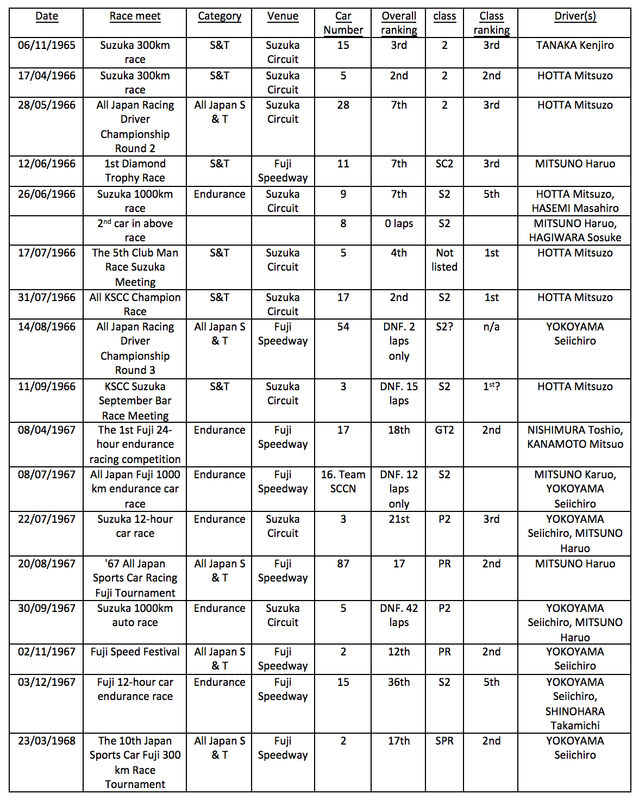 Any more motorsport results for MINATO san? These are all the results I could find where a Nissan Silvia (CSP311) competed on JAF (Japan Automobile Federation) website. 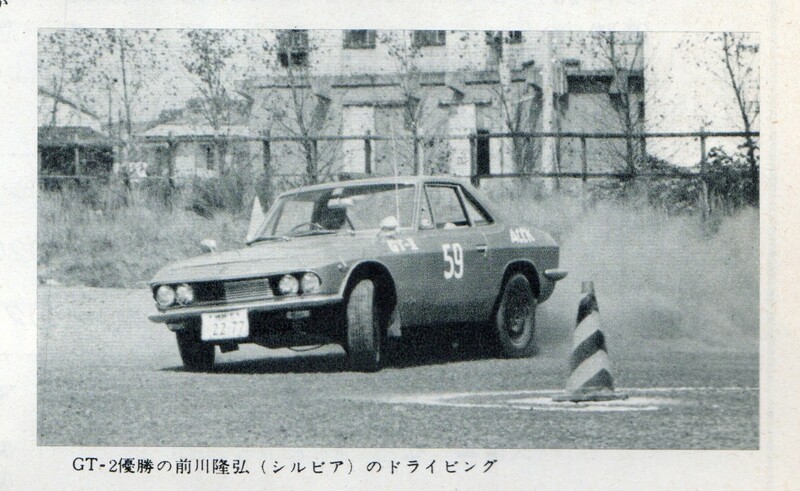 This is MrTAKAHASHI Akira, taking part in the SCCJ (Sports Car Club of Japan) Gymkhana event held at Soka City on 4th March 1966. He came second in the GT-C class. 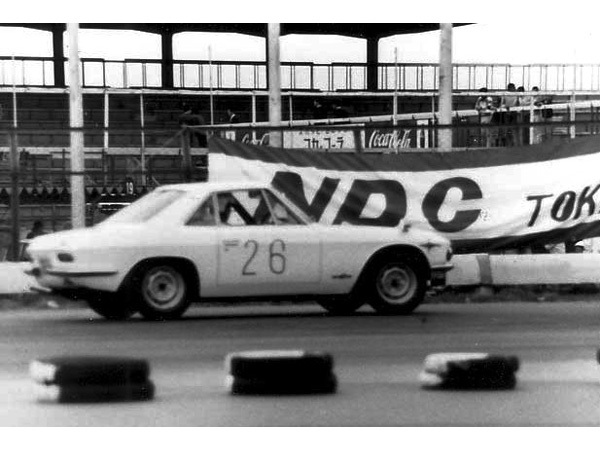 All Japan Racing Driver Championship Round 2 at Suzuka (28/05/1966) where the Silvia driven by HOTTA Mitsuzo finished 7th overall. 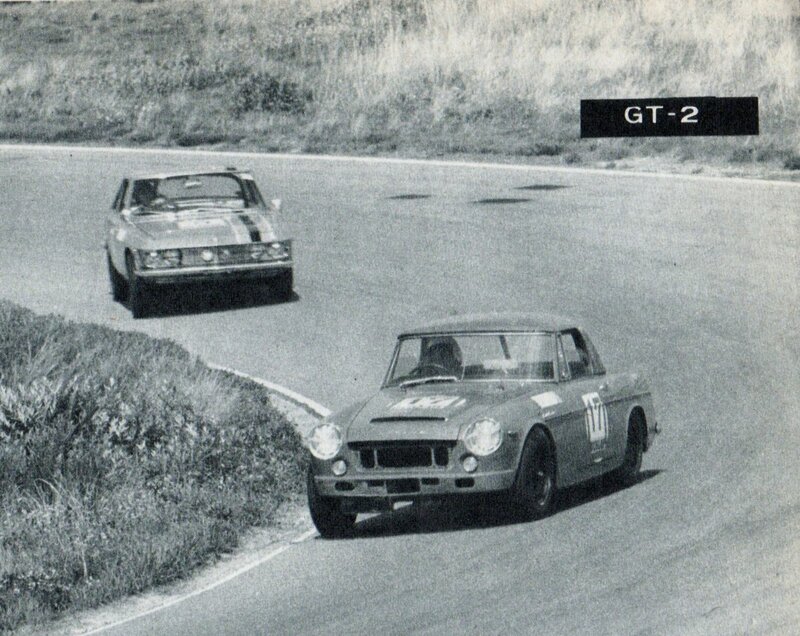 There were multiple Toyota S800, Fairlady and Honda S800’s entered into this race. 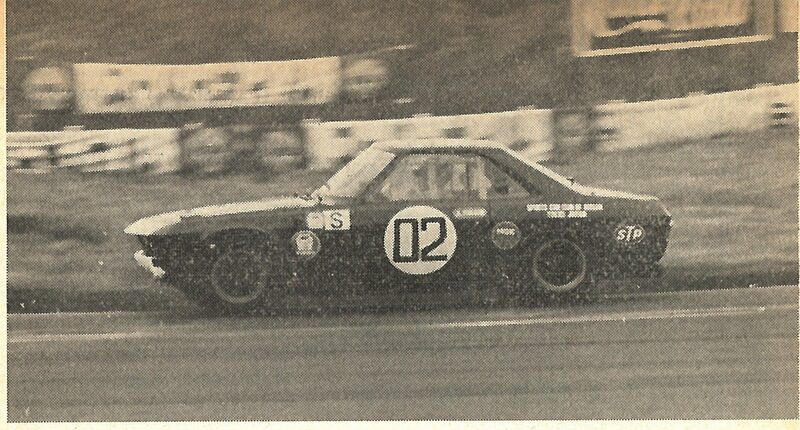 I cannot see the car numbers so cannot determine who the drivers are of these cars behind the Nissan Silvia. 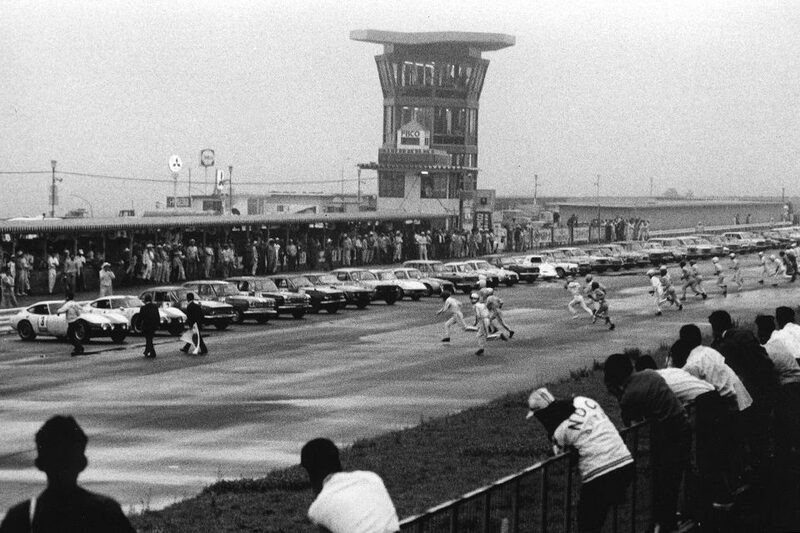 This is the Suzuka 1000km race in June 1966. Nissan Silvia driven by HOTTA Mitsuzo. That is SCCN works driver HASEMI Masahiro in the Skyline GT (No.29) behind the Isuzu Bellett ( No.34, driven by either TAKANO Masaya or his co-driver YONEYAMA Jiro) which finished 12th overall. The Silvia (co-driven by HASEMI Masahiro) finished 7th overall. Hang on, what is going on with HASEMI Masahiro? He is listed as driving the Silvia and the Skyline? 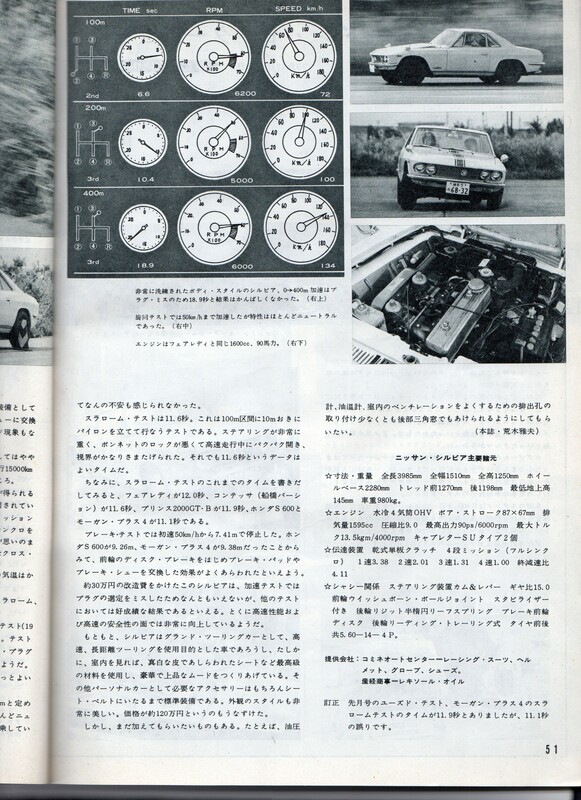 The magazine article the picture came from (written nearly a year after the race) mentions HOTTA Mitsuzo doing well in the Silvia and being in front of HASEMI Masahiro at that point (in regards to the picture and HASEMI san is mentioned specifically). But looking at the race results on JAF, HASEMI Masahiro is listed as being in the Skyline GT (No. 28). Being a SCCN works driver did he swap cars to No.29? But according to JAF, none of the four Skyline’s completed any laps. If indeed HASEMI san is driving a Skyline, who is the co-driver of the Silvia? Is the image from the practice session? Is the magazine article wrong in some way? Is JAF? 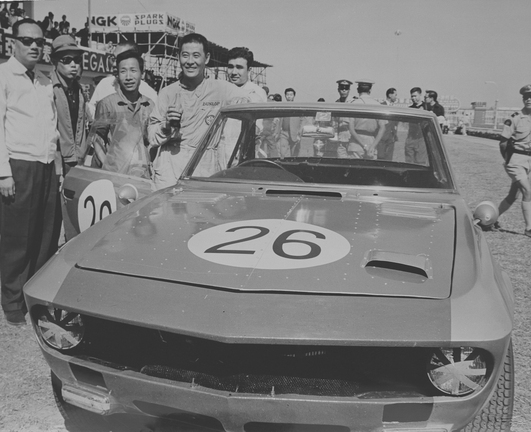 This image is from the 5th Clubman Race Meeting at Suzuka Circuit, held on 17th July 1966. 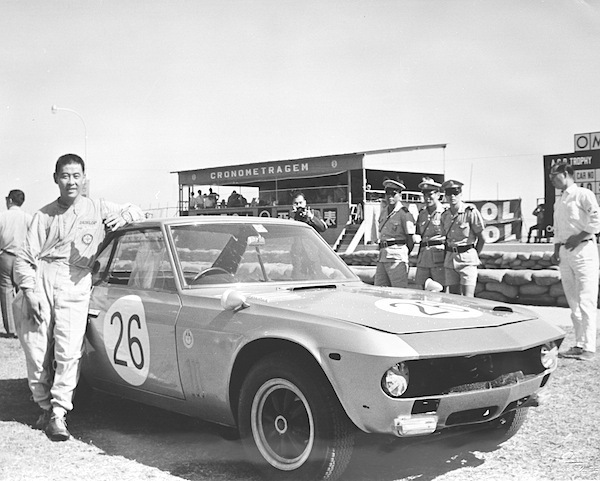 Mitsuzo HOTTA won the GT-2 class race as the only finisher, as all the other competitors – including Nissan works SCCN ace driver TAKAHASHI Kunimitsu in the Fairlady shown – crashed or broke. 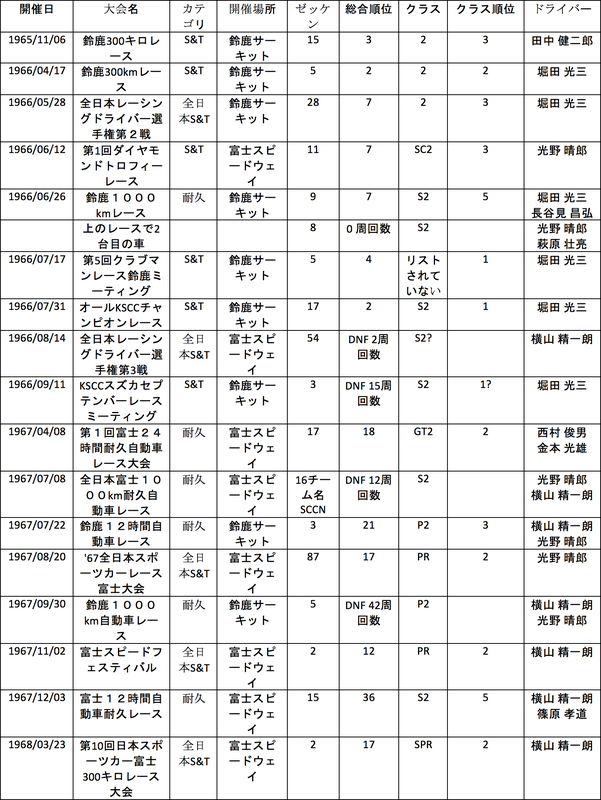 HOTTA Mitsuzo silvia’s classification result in table above. From the 6th Kansai PCJ (Porsche Club Japan?) 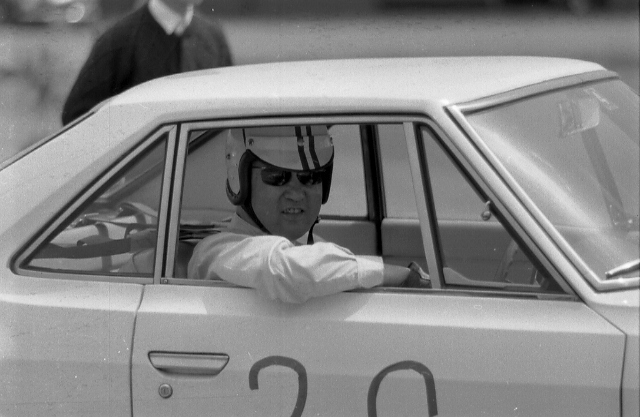 ‘High Speed Gymkhana’ meeting in Kobe on 4th Sept. 1966: MAEDA Takahiro won the GT-2 class in his Silvia, beating a Porsche 356A and a Fairlady. 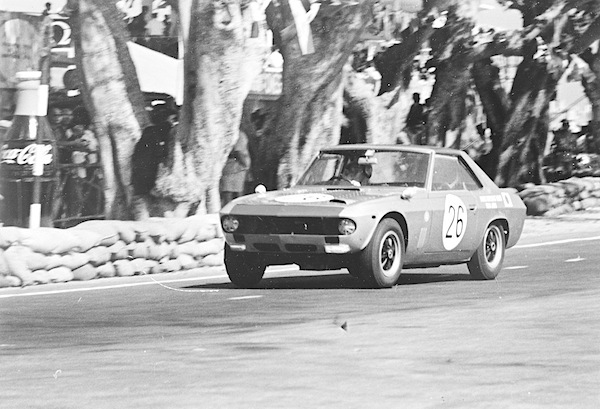 The next five images are the 13th Macau Grand Prix held on the 19th and 20th November 1966. I take this as the start of the Grand Prix. Silvia of YOKOYAMA Seiichiro to the left (above), and below, a quick start to overtake the two Lotuses. YOKOYAMA Seiichiro, who finished 6th place overall (ACP trophy 2nd place) in the Macau GP race which took place with a mixture of cars in each class. 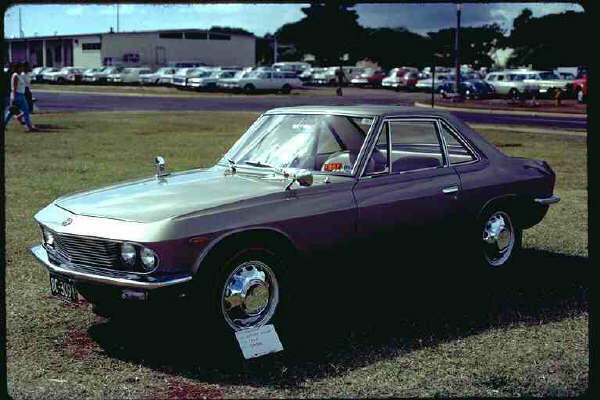 Nissan used this result in an advert for the Silvia, original, un-cut advert below. 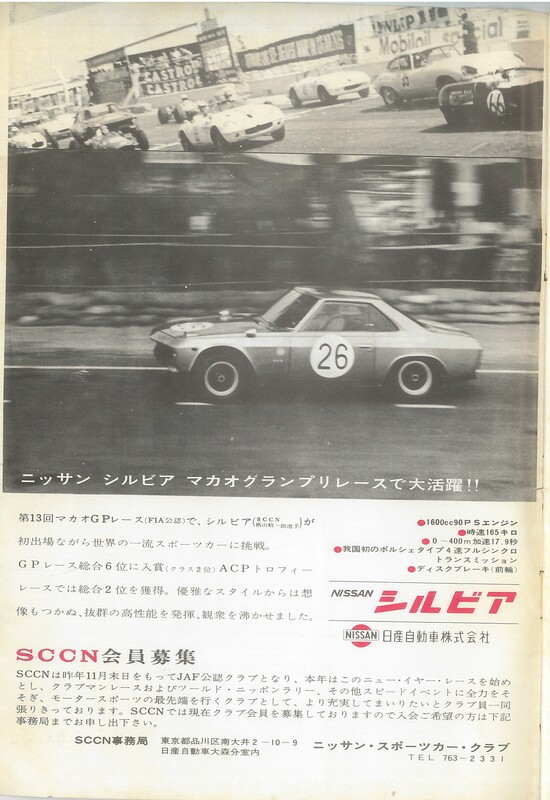 Japanese kanji in above image says, “Nissan Silvia Macau GP great success!”. 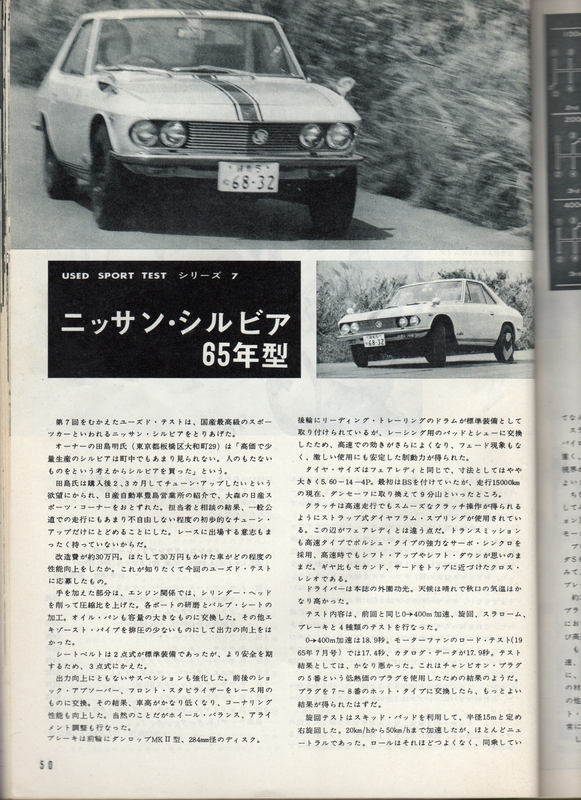 The advert featured in the program magazine for the All Japan Car Club Confrontation Race Meeting on the 15th January 1967. You can just make out the front of the Silvia, 7th car from the left. The drivers, NISHIMURA Toshio/KANEMOTO Mitsuo would eventually finish 18th (from the JAF table above). 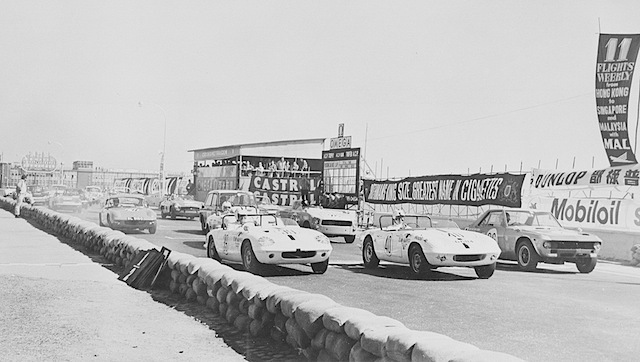 The two Toyota 2000GT’s at the front of the Le Man’s type grid finished first (car No. 1) and second (car No.2) with the paired drivers being HOSOYA Shihomi/OTSUBO Yoshio and TSUTSUMI Tomohiko/FUSHIDA Hiroshi respectively. I have yet to determine if this Silvia has a motorsport history, but the magazine, Autosport are certainly reviewing it for its performance capabilities. 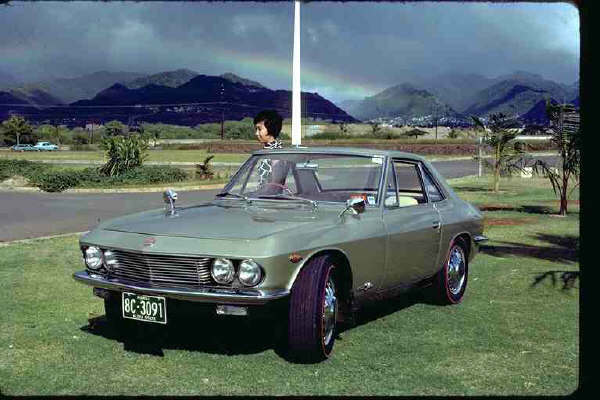 This is Elroy A. Goto’s Silvia, who was a Nissan factory sponsored race car driver and also the parts manager of Nissan in Hawaii. This Silvia still exists and is on the mainland USA. 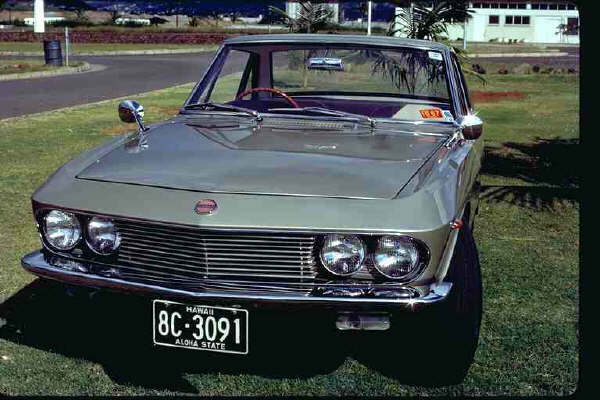 This Silvia (which still exists) was the personal transport of John B. Roxburgh, Datsun racing chief in Australia. 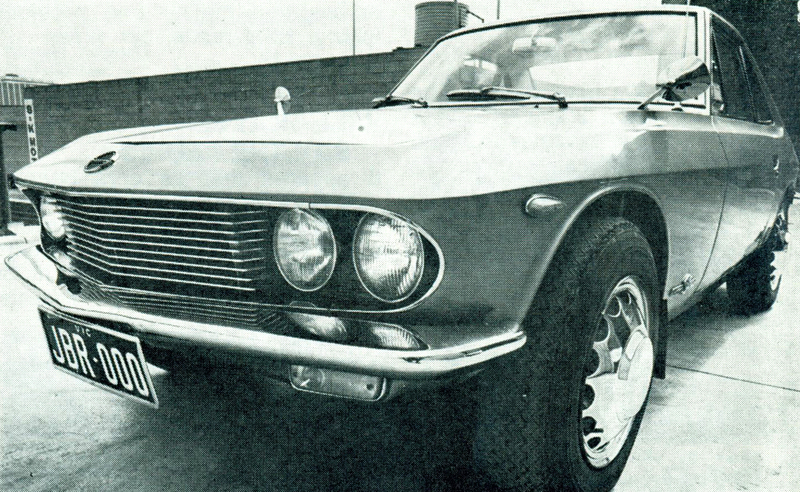 From Datsun News, Feb. 1970. Vol.8 No.1. 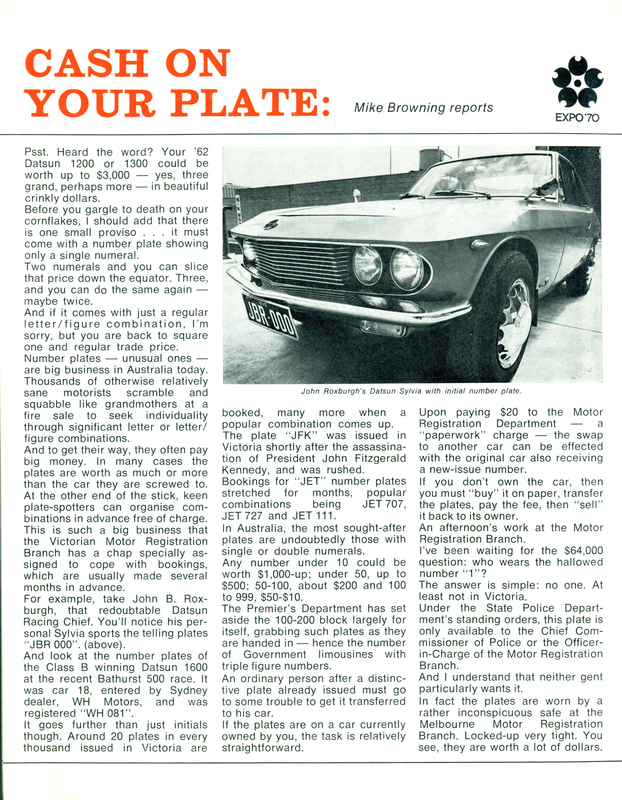 A Datsun Australia publication. Thank you to Alan and Dmitry for sourcing some of these images.